Open canoes, or Canadian canoes, were originally used by native Indians in the northern United States and Canada. Their use has changed over the years from an essential vessel for trade, to a recreational boat for everyones enjoyment. 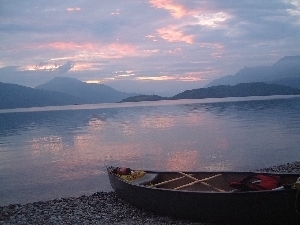 Whether on flatwater lochs and gentle rivers, or extreme white water and expeditions, the canoe is very versatile and can be adapted to suit many situations. In the past they were made out of wood, and today you can still see canoes made of wood, which is indeed the most aesthetically pleasing material, but the most common construction today is plastic. As with kayaking, Paddlepower and Adventure have lots to offer, from one-day trips, to expeditions with overnight camps in beautiful remote locations. Let us know your level of experience, but most trips are suitable for both novice and expert. Click Course Programme to see what is available. However, if you cannot see what you are looking for, please do get in touch, as we are always happy to put a trip together a trip especially for you. The Foundation Safety and Rescue course, as the name suggests, lays the foundation that all the other rescue courses are built upon. This training course will give the candidate the necessary skills and knowledge to look after and rescue people in a sheltered water environment. This course is open to anyone wanting to improve their knowledge of rescue techniques, and skills in applying them. The course provides valuable skills, and isn't just for people planning to do star or coaching awards. There is no assessment for this course. Your rescue skills will be assessed later through either star or coaching awards. Click this link for the BCU Foundation Safety and Rescue syllabus (External Site). Paddlepower and Adventure run Foundation Safety and Rescue courses. Click Course Programme to see when the next one is. The 1 Star Award is the most basic. To pass, the individual must demonstrate basic control of the boat and foundational skills. This is a generic award - the candidate can undertake the test in any paddlesport craft - open canoe, sit-on, sea, surf or white water kayak. Click this link for the BCU 1 Star syllabus (External Site). Check Paddlepower and Adventure's Course Programme for 1 Star courses. The 2 star is an improvers' award designed to develop fundamental paddlesport skills on flat water. It is generic therefore taken in both kayak and open canoe. The emphasis is on gaining a breadth of experience, creating the desired movement of the boat and developing an understanding of how the paddle, boat and water interact. The candidates performance will be measured against the BCU syllabus. During the assessment the candidate will lead a simple journey on flat water. The journey will be about 30-60 minutes in duration. Click this link for the BCU 2 Star syllabus (External Site). Paddlepower and Adventure run both training and assessment courses at 2 star. Click Course Programme for 2 Star courses. The 3 star is a discipline specific award of an intermediate level designed to show that the candidate can paddle on simple flows and open water with winds up to and including force 3. This course will give the candidate the necessary skills to be able to manoeuvre their open canoe in this environment. As well as looking at skills to control the boat we will also look at water and wind features and how these interact with the boat and affect the boat's handling. Click this link for the BCU 3 Star Open Canoe syllabus (External Site). Paddlepower and Adventure run both training and assessment courses for 3 Star Open Canoe. Click Course Programme for 3 Star Open Canoe courses. 4 Star Open Canoe is a leadership award designed to show that the candidate can lead competent people (Competent means people that do not require coaching to be in this environment) on moving water up to and including grade 2, and open water up to force 4. This course will give the candidates the necessary skills to lead people in this environment, including personal paddling, rescue skills and leadership strategies. Click this link for the BCU 4 Star Open Canoe Leader syllabus (External Site). Paddlepower and Adventure run both training and assessment courses for 4 Star Open Canoe Leader. Click Course Programme for 4 Star Open Canoe Leader courses. The White water safety and rescue training course will build upon knowledge gained from the foundation course, and will enable trainees to learn new skills and learn how to apply these skills in a moving water environment up to grade 2. This course is open to anyone wanting to improve their knowledge in this important safety area. It can be taken in isolation, and needn't be part of the quest for star of coaching awards. The course is not assessed - white water safety and rescue techniques are assessed during 4 Star Leader Assessment. Click this link for the BCU White Water Safety and Rescue syllabus (External Site). Click Course Programme to see when the next course runs.